Coaches Louise and Tom Vaughn and Martin Plunkett led children through a variety of drills on the SPARTA track. Hurdling was a popular activity and Louise was particularly impressed by Charlotte Axtell’s natural technique. Charlotte was pleased to get some coaching tips from Louise before sprinting off round the track. On hand to help with the activities was Head of PE at Saar, Mark Holness. Athletics proved very popular in the first term and our coaches are hoping to continue training the Olympic stars of the future. 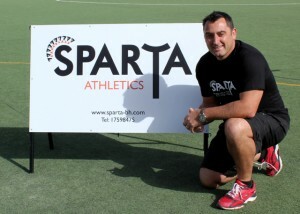 Athletics Coaching takes place on Tuesdays and Saturdays. Please see www.sparta-bh.com for details.